I recently passed the 300 Facebook 'likers' mark - quite a milestone for little old me! To celebrate and to show my appreciation, I wanted to have a special giveaway. But first, let me tell you how I found this beautiful gift. A couple of months ago, just as I was preparing to go back to work full time and feeling very sorry for myself about having to leave my little peas all day long, I came across this featured guest post at Delicate Construction. 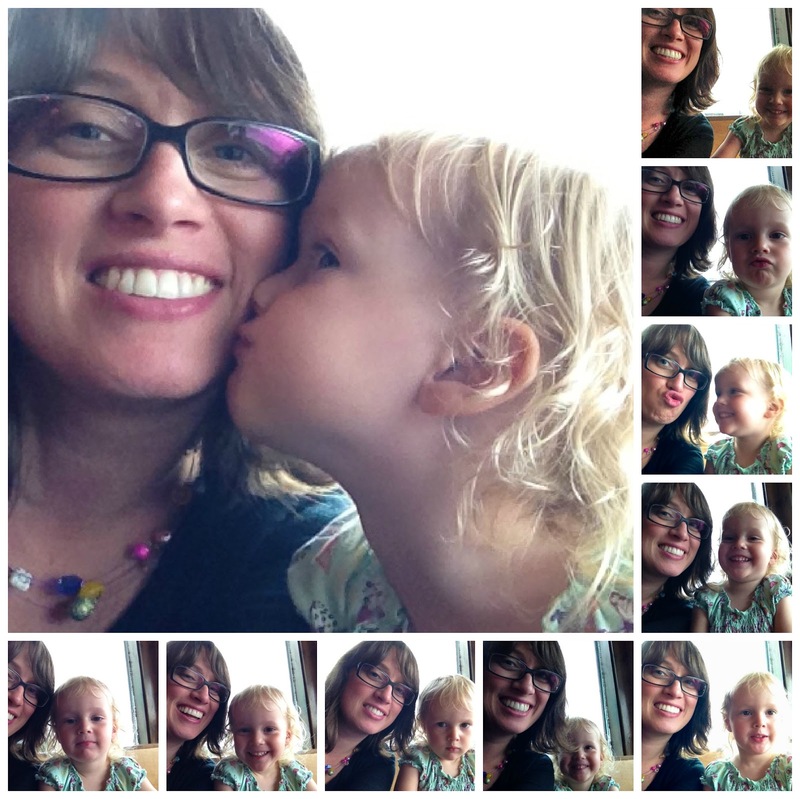 The guest being featured was Amy of One Artsy Mama. 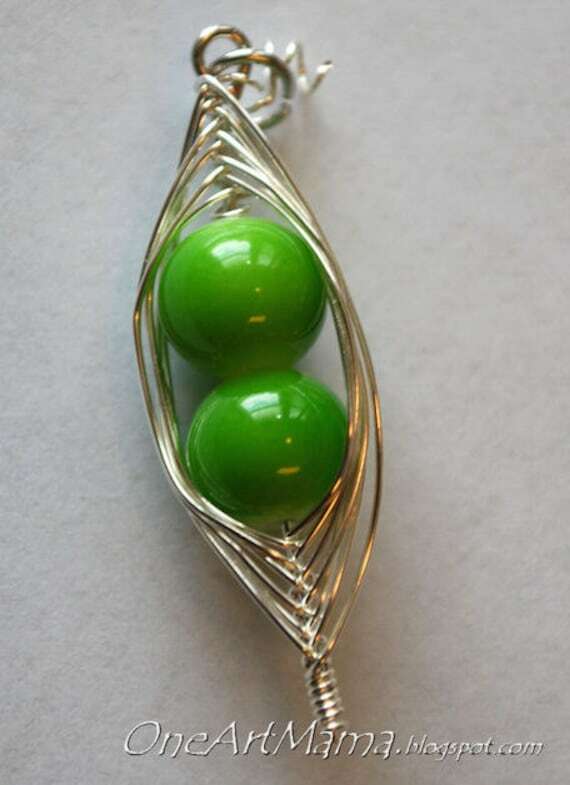 I clicked on over to her blog and immediately noticed this picture of a pea pod necklace from her etsy store. Well, of course I fell in love with it immediately and needed to have it! (I am Mama Pea Pod after all, right?) And I thought it would be the perfect way for me to 'hold onto' my little peas all day long throughout my workday. So I ordered myself one to try to cheer myself up. It arrived very quickly (shocking for the Hungarian postal service! And even unopened! ), all wrapped up very sweetly. I was so excited to get it; I just LOVE it! In fact, I'm going to order the matching earrings for myself and another necklace for a friend for Christmas (ssshhh, don't tell!). 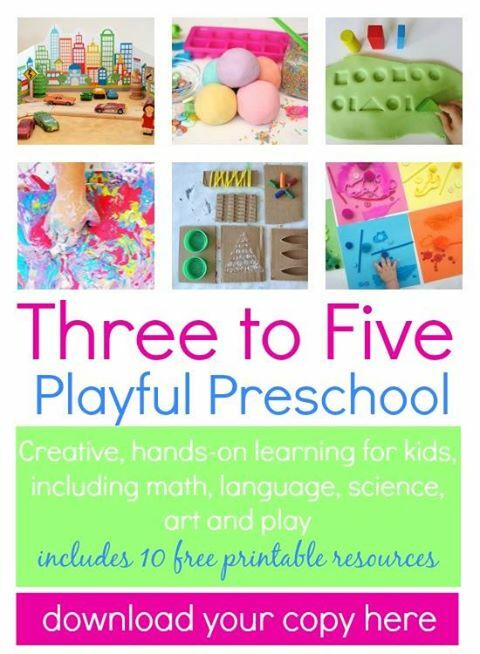 The prices are super reasonable and One Artsy Mama even offers free shipping to select countries! So when it came time for an extra special giveaway, what better way to show my appreciation? ** Lovely Amy kindly agreed to let me host a giveaway of one of her beautiful jewellry pieces for Mama Pea Pod readers! If you win, you can choose a piece for yourself (or as a gift? Holiday season is coming soon, you know!). 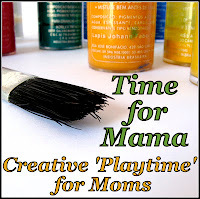 All you need to do to enter is visit the One Artsy Mama Etsy store, browse around, then come back here and leave a comment telling me which piece you would like to win. Now, because this came about because of reaching a milestone for my facebook page, I also want to show you that I 'like' you too! So if you have a facebook page of your own, please leave the link with your comment and I will 'like' every page linked here, too (if I haven't already). The winner of the giveaway will be selected randomly through Random.org. If you'd like additional entries, you can mention this giveaway on twitter or write a blog post linking to it. Please come back and leave a separate comment for each entry (and a link to your post). Contest is open to US/Canadian/Hungarian addresses. Contest closes November 6th, 2011, 11:59pm GMT+1. I've been meaning to write this post for weeks as we made these early in the school year, and I haven't gotten around to it 'til now, but here it is - JUST in time for a last-minute Halloween craft. No worries, though, as you most definitely have everything you need to do this in your house right now! We made these ones in my first grade EAL class. The kids LOVED making them (and the 4th and 5th graders were quite envious when they saw them in my classroom!). They couldn't be easier to do. All you need is a cardboard box from the recycling bin (we used mostly tissue boxes and cereal boxes); some paint (or you could wrap them with paper instead); bottle caps; googly eyes if you have them (but no worries if you don't, we ran out and the second group just used markers instead); various craft odds and ends (we used pipe cleaners, popsicle sticks, bits of craft foam, buttons, and yarn); and some kind of glue (some kids used glue sticks, others used white glue). For more ideas for what to do with a tissue box, see the Tissue Box Challenge at JDaniel4'sMom! For more seasonal inspiration, see my Halloween and Fall pin board. Yay! We're back! Use the share buttons below to spread the word, invite others, and come link up your ideas for getting your kids to PLAY OUTDOORS! We have a new cohost joining us, Kierna from Learning for Life, so be sure to drop by and say hello to her. 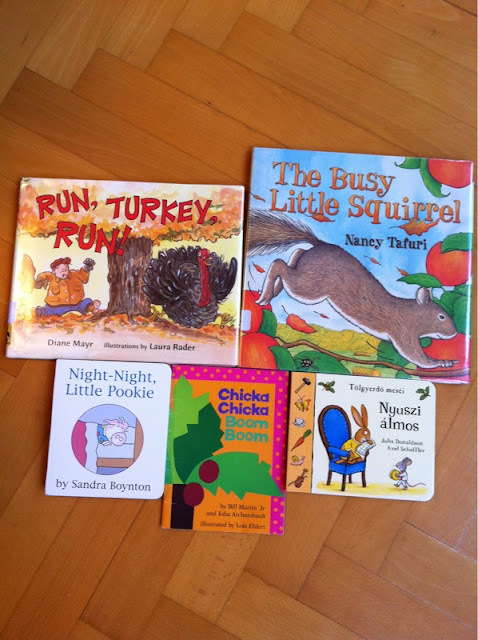 She teaches in a wonderfully enlightened preschool where the kids go outside to play in any kind of weather. As their motto says, "There's no such thing as bad weather, only different kinds of good weather!" Abbie of Greening Sam and Avery is back, too. 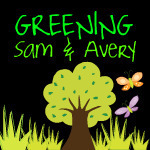 If you haven't visited this green mama before, do pop over and see how she is raising her two sweet girls to appreciate nature and the outdoors. 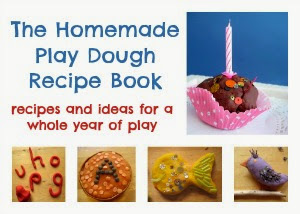 We also have a new Outdoor Play Party Pinterest board, where we will be pinning all the great ideas submitted! So, why do we want you to get your child PLAYING OUTDOORS? Read this for some great reasons! My own girls have been loving playing in and with the Autumn leaves! Before the weather turned cold, they spent many days gathering them up from all around the garden and making their own sensory play experience - crunching and crumbling the dry leaves in their hands, listening to and trying to imitate the sound they made. We brought some inside and Sweet Pea made a leaf collage - her first time using glue! Then Sweet Pea and I went out on our own for a leaf hunt. but instead it led to the discovery of three large mud puddles! (and fascinated when one fell off the tree in front of her and landed right on her playing in the puddle). And pretty soon the 'leaf hunt' turned into 'play in the mud puddles' instead! What fun she had splashing and swishing the leaves around! The leaf rubbings will have to wait until another day. Share your ideas for outdoor play activities with us every week! Here’s just a few guidelines for sharing. Please remember to link back to this post and help us spread the word about the importance (and fun!) of outdoor play! You can grab my button from the sidebar. PS - Sadly, Kate from An Amazing Child is no longer blogging, but we hope she will be back again someday to share her wonderful inspiration with us all. *Update: ^^^ This year (2013) we made them using silicone cupcake cases and store-bought candy eyes. Cute, aren't they? 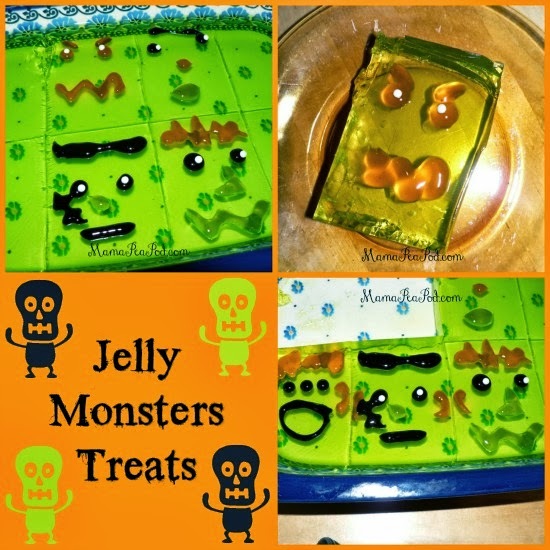 Last week Princess Pea and I made jelly monsters for a special dessert! We used tubes of black, purple, and orange gel icing to make monster faces on each block, and little balls for cake decorating as the eyeballs. The purple gel icing didn't turn out very well, though, and looked green against the green jello. We were able to get them out (mostly) without breaking by taking out the corner block first to make space to get a wide spatula in there, then very carefully taking out each block. Looking for more seasonal inspiration? Check out my Halloween and Fall pin board. After our little peas decorated the windows for Halloween with these fun gel window stickers, they decided they wanted to transfer some of them to a pumpkin instead! Easy enough for even the youngest of peas! And these gel window stickers are so fun to touch and play with, they make for a great sensory experience to boot! 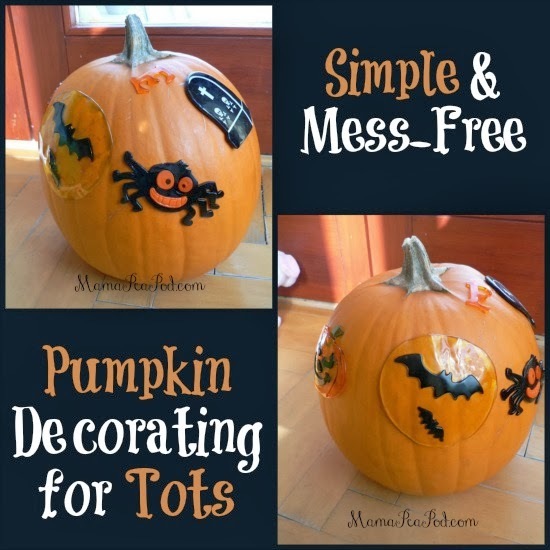 Looking for more Halloween fun ideas? And be sure to check out my Halloween & Fall pin board, too, for more seasonal inspiration. *Be sure to check out all the Halloween fun we have for you! These jack-o-lantern suncatchers are so easy to make that our 19 month old made this one, and it even has moveable parts so that the face can be re-made as many times as she likes! .... and cut it out. Then I cut a piece of contact paper (the sticky-backed, clear plastic stuff you put on book covers) and taped it sticky side up onto the table to hold it in place. Then Sweet Pea and I tore up some orange crepe paper into small pieces (she loved helping with this!). Tissue paper works too, but crepe paper is thicker so makes a more vibrant orange colour. Next I used double sided tape around the foam pumpkin to attach the contact paper 'sandwich' and trimmed the edges. I just taped it onto the window, and the sun shines through the crepe paper, making it 'glow' orange! Finally, I cut out a few foam shapes and let her use water to stick them on to the contact paper (as we did with our foam window clings). They can easily be removed and reattached with just water! For more seasonal inspiration, follow my Halloween and Fall pin board. This post was featured in the Inspired By Family magazine! *It's HALLOWEEN WEEK here at Mama Pea Pod - be sure to check back every day this week for more Halloween fun! Last summer I got some fun Halloween-themed gel window stickers on sale super cheap at Michael's. I almost forgot about them, but this morning I found them as I was rummaging around in our big art box for something else. The gel is sticky and gooey and stretchy, and is fun to play with (for all ages - me included, hehe!). They can be removed and stuck back on again infinite times (in theory, anyway - in reality they do eventually get too dusty and fluffy to stick anymore). So glad I found them, as they've provided a good hour's entertainment for my two little peas so far today! For more seasonal play and crafting inspiration, follow my Halloween and Fall pin board.